Shazia Ilmi fires from all cylinders in Ghaziabad, one of the most watched constituencies in this election. Rediff.com's Archana Masih was present at one of AAP candidate's meetings. 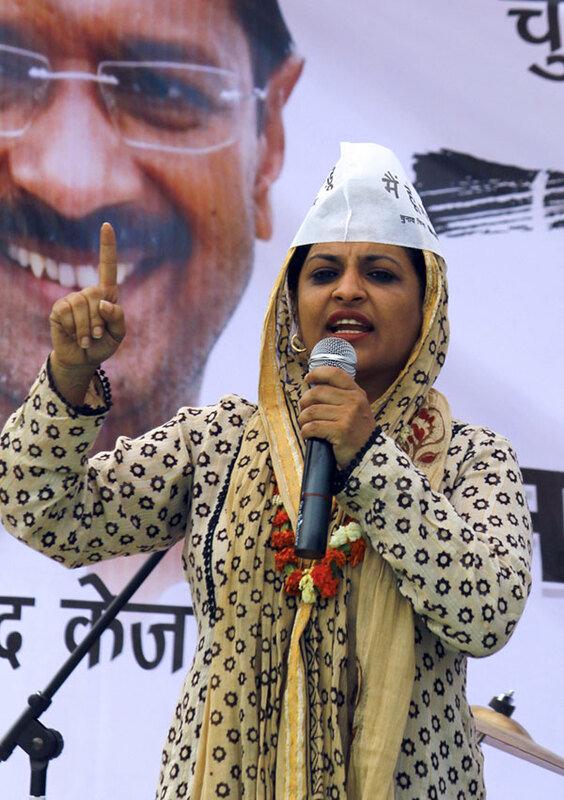 Shazia Ilmi, the AAP candidate from Ghaziabad, Uttar Pradesh, is a fiery campaigner. Standing on a stage dominated by women, young supporters and a band that sings Sabse Aagey Hongey Hindustani -- a song that is also a favourite at the lowering of the flag ceremony at the Wagah border -- she flays her arms, attacks her opponents and makes promises to the voters. In between all this she is interrupted by a woman from the crowd who brings two children near the stage. "These children spend the whole day collecting plastic packets from the garbage dump," she says, partly looking at Ilmi and the crowd gathered in the Shalimar Garden area in Ghaziabad. "We need schools for these children." AAP supporters clap as the woman walks back to her place in the crowd, pulling the children with her. "Didi, tell me your name," says Ilmi from the stage. "What Meher didi has said, is absolutely true. This is what we want," says Ilmi and continues with her speech. The atmosphere is like a mini carnival, youngsters with flags, brooms, caps and music. "Desh ka neta kaisa ho, Shazia Ilmi jaisa ho (The nation needs a leader like Shazia Ilmi)" people below the stage shout out. Ilmi interrupts, points to the crowd and says: "Nahin, desh ka neta Aap ke jaisa ho (The country's politician should be a common man like you)." Image: Shazia Ilmi, the AAP candidate from Ghaziabad, is pitted against General V K Singh of the BJP and Raj Babbar of the Congress. Ilmi, who lost the Delhi assembly election by 326 votes last December, is pitted against Raj Babbar of the Congress and General V K Singh of the Bharatiya Janata Party, making the contest in Ghaziabad one of the most watched in this election. Please click on the video above to hear Shazia Ilmi's campaign speech! Facing a tough battle, she is banking on being on the home turf of AAP leaders -- Arvind Kejriwal, Manish Sisodia and Kumar Vishwas -- all of who are residents of Ghaziabad. Till he moved out a couple of months ago, Kejriwal was a resident in the Indian Revenue Service flats in Kaushambhi. The seat is represented by BJP President Rajnath Singh, who vacated it for General Singh and has moved to Lucknow, a seat held by former prime minister Atal Bihari Vajpayee for five terms. "Rajnath Singh is such a mighty leader of the BJP, whose ambitions have become even loftier. When he couldn't do anything for you, will a new neta be able to do anything?" she asks. "Wherever General V K Singh goes, people ask him about what Rajnath Singh has not done. And what can I say about Raj Babbar -- all he says is that he will take your voice to Rahul Gandhi." "Pehle Sheila hari hai, Ab Modi ki baari hai (Sheela Dixit, you lost first, Modi now it is your turn)." Towards the end of the meeting, a bedsheet is passed around the crowd, Shazia requests the crowd for donations. "Rs 1, 5 or 10 -- anything you can afford. Your one rupee is like one lakh and ten rupees is like ten lakhs for us. You will all get receipts for your contribution." As the sheet is passed around two old men come up and seize the mike and break into Urdu shayari (couplets). The crowd cheers and bars of guitar strumming crackle out of the speakers. The meeting ends with the national anthem to the strains of the guitar. AAP workers make a ring around Shazia as she makes her way to the SUV. On her way, Meher, the woman who had brought the two children who spent the day collecting plastic wrappers for a living, stops Shazia. "Promise me, that you will make a school right here when you become MP. Make me this promise today." Poll meme of the day: Chora Ganga kinare wala!